Optimize your facilities’ ability to effectively manage a patient surge with this one-of-a-kind tabletop training kit. Players assume HICS position roles under the command of the Casualty care Unit Leader as they prepare for and manage an influx or injured patients arriving from EMS and self-transport. Triage teams rapidly assess waves of incoming patients that are sent to treatment areas in perpetration for transport to alternative facilities or local admissions. Players learn the responsibilities of each position as they interact with each other using effective radio communications. Simulated logistical issues such as limited bed availability and random ambulance delays create a real-world leaning environment that teaches effective resource management. Adaptable to any surge plan including 15 ‘til 50. Players learn how to work as a team to effectively manage a patient surge. Teaches HICS position responsibilities and command structure. Demonstrates resource management and patient movement prioritization. • Large 6-foot roll-out vinyl map with case. 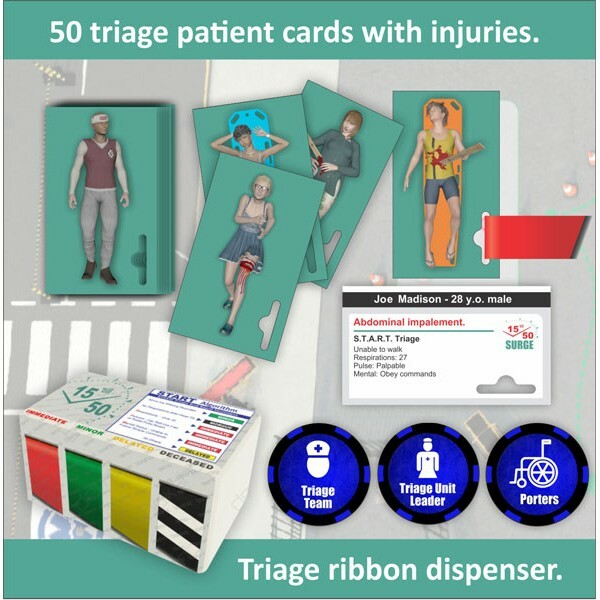 • Triage ribbon dispenser with triage ribbons. • Binder with forms and job action sheets. • 4 Treatment area tarps.